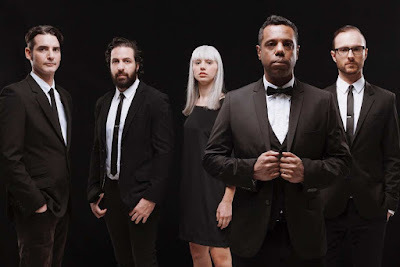 Montreal band The Dears have announced not one but two albums on the way, with the first new song ready for a preview. The band returns using typical thoughtful prose for a title, "I Used to Pray for the Heavens to Fail," and the sound is straight out of the gate epic. With lush, dense instrumentation that infuses the tune with orchestral pop rock flourishes, founder and singer Murray Lightburn takes us on yet another musical journey. The new album, Times Infinity Volume One, is due September 25 via Dangerbird Records, with additional material spilling into Times Infinity Volume Two, out in early 2016. It is the first album since 2011's Degeneration Street, the group's fifth release since 1995. A fan of the band already, I caught the band on tour around that time and the single "Omega Dog" found its way on my Winter 2011 New Music Playlist. Back then I also had the opportunity to interview keyboardist and Lightburn's wife Natalia Yanchak for PopMatters, when she was a new mother. I know well that during that time of life keeping any sort of side projects going is not easy, much less being in a band. But over the past two years, the process began again and things began to click into place musically. As Lightburn says, "When you start a band, you never think of the end. When we began work on this album, it was a process that consumed us completely, harkening back to our earliest days. In turn, the record became about sentimentality but in the face of great uncertainty; the concept of eternal love and all its fragility." With those words, take a listen to the song here or on Soundcloud and be ready to be moved beyond the surface into deep emotions -- something The Dears always do so well.